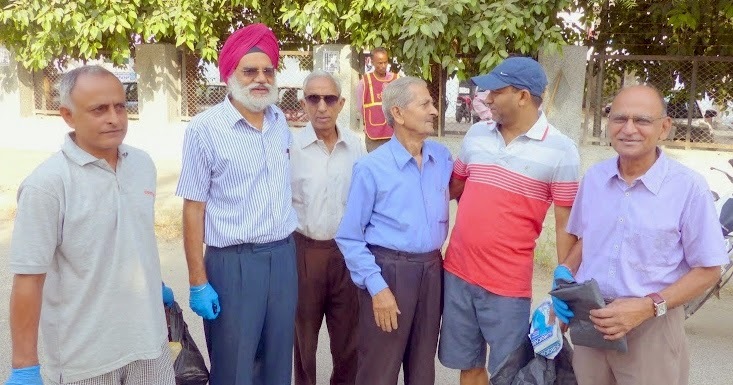 ‘Sukh Dukh Ke sathi Santha’ (SDKS), an association of dedicated senior citizens devoted for the social cause in Dwarka (New Delhi) gave a call to the residents of Dwarka (New Delhi) to take up a weekly cleaning drive in the sub-city, apropos the call of Hon’able Prime Ministrer of India, Shri Narendra Modi. The campaign was flagged off in Sectors 23 in the wee hours of 2nd October 2014, pious birthday of Mahatma Gandhi, Father of the nation. SDKS started preparation of this campaign a week ago with holding meetings of local residents, Co-operative Group Housing Society management committees, Resident Welfare Associations and concerned Government bodies. A crucial meeting was held with Deputy Commissioner of South Delhi Municipal Committee (SDMC) Shri Suresh Yadav on 28th September for their support. Appreciating the initiative of the senior citizens, Shri Yadav offered to come himself to attend this meeting in Dwarka sector-22 with all his concerned officers. The officers of Horticulture Department of Delhi Development Authority were also invited to attend this meeting and to extend their support. Representatives of other social organizations of Dwarka e.g. Dwarka Forum, Ek Sangarsh, Natural Heritage First, ANLGT, Sanjh Sawera as well as nearby RWAs also attended the meeting with full enthusiasm. Shri Suresh Yadav listened to the problems and suggestions put forth by various people and issued on-the-spot instructions to his officers. He firmly assured to extend full support of SDMC to make SDKS ‘Swachchhta Abhiyan’ a great success. It was a fascinating morning on 2nd October 2014 in Sector 22 and 23 of Dwarka (New Delhi). 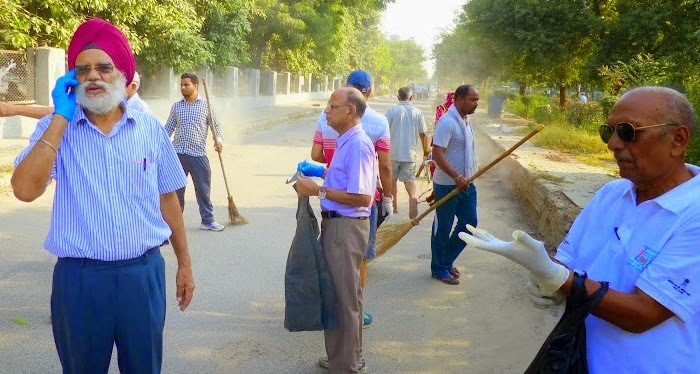 SDKS members, local residents, CGHS MCs/RWA members with their employees and well dressed and equipped staff of SDMC, all were seen cleaning the sub-lanes and pavements of the residential complexes with full enthusiasm. A meeting of CGHS/RWA members and the social organizations of Dwarka was convened by SDKS to congratulate them for this successful programme and chalk out modalities to extend this campaign to entire Dwarka and continue this programme for ever. Shri S.K. Kapoor, Gen. Secretary SDKS, Shri Sushil Kumar, President Dwarka Forum, Shri Shobhit Chauhan, the founder of Ek Sangharsh, Shri Diwan Singh of Natural Heritage First, Shri Robin Sharma, Social worker, journalist and President of Sector-6 Market Association, Shri P.B. Mishra, Secretary SDKS and few others contributed their suggestions. Shri Sushil Kumar, President Dwarka Forum offered services of his association to extend this campaign to entire Dwarka and was agreed by the representatives of SDKS and other social associations present in the meeting. Shri D.C. Mathur of SDKS suggested to form committees of 3 or 4 selected residents in each residential sectors and markets for this purpose whereas Shri Robin Sharma offered to provide plastic bags and hand gloves. Shri Diwan Singh of ‘Natural Heritage First’ suggested to develop Bharat Vandana Park of Dwarka Sector 20 as a bio-diversity park whereas Shri Perminder Khetrapal of SDKS submitted a plan for collecting kitchen waste from the residents and convert the same into green manure. It was decided to visit SPG Residential Complex in Dwarka Sector-8, where such a project was already functional.